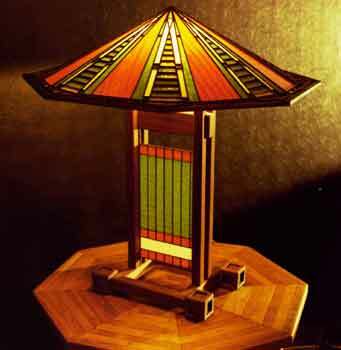 This lamp design is modeled after one of several table lamps designed by Frank Lloyd Wright for the Dana house (1903) and the W. R. Heath house (1905). A Dana lamp similar to the enclosed design sold for $132,000 at a Christie's auction in New York on Dec. 12, 1988. Replicas are sold for $5,500. The enclosed plans were derived from the Dana design. Changes were made to facilitate construction by crafts people with tools found in small shops. 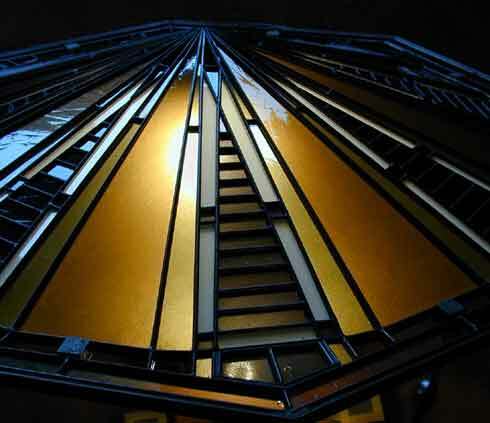 There are two major differences between the original lamp and these plans; a lamp harp is used to support the shade instead of two posts and the base is made of wood rather than metal. 4 sheets of plans, 30" by 42"